Launched and founded by mother of two, Melissa Bossola Beese, Little Pnuts is a home delivery service of eco-friendly toys for infants, toddlers and preschoolers that are geared towards their developmental milestones. 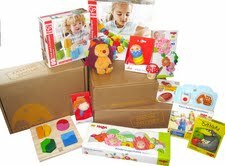 Little Pnuts packages feature only the newest, most innovative and highest quality toys from the European toy market not easily accessible in the US. These toys do not have the bells, the lights, the music and the “do-it-for-you” buttons. Little Pnuts brings you the best in sustainably made, ecologically friendly, organic, and naturally made toys— all shipped right to your door! Little Pnuts’ experts hand curate each special delivery, featuring 3-5 toys in each shipment, to arrive in your home every three months. It offers three unique Special Delivery programs to choose from in addition to member-only Special Occasion Add-ons. Each Special Delivery features products thoughtfully crafted by its experts. And don’t forget—these toys are not samples or rental toys, they are yours to keep! Click here to visit Little Pnuts website. Click here to Like Little Pnuts on Facebook. WIN: 24/7 MOMS Little Pnuts are giving away a Little Pnuts Toddler Box. US entries only and one entry per person. Winner will be chosen on August 18, 2012. * We received a complimentary Little Pnuts toddler box for review no financial compensation was received.